Fog and reality! Cloud and mappemonde! Recently, I opened my Facebook account to see the juxtaposed images of two maps of the United States. The first map illustrated the results of the 2012 American presidential election: blue states for the Democrats and red states for the Republicans. The second map, dated 1846, was a representation of abolitionist and slave states before the start of the American Civil War. The concept of mapmaking inspires respect; there is an air of truth and authenticity about the practice. It is difficult to doubt the reality of map, maybe because of an innate trust we carry for them. In any case, I was there at my computer, confronted with this terrifying image of an unchanging world. And I was disappointed to think that we, as a society, have made such a long journey to be staring back at that very sad starting point. After a few minutes, my enthusiasm to share this with other Facebook users quickly turned into interrogation. What was the reality mapped out before me? Is the world of today really the same as the world yesterday? To put it all in a historical context and to see if the American electorate had evolved over the years, I began to think of other presidential elections. I thought right away of the Ronald Reagan tidal wave of 1984. The winds of conservatism swept across America leaving only Minnesota and Washington, DC to the Democrats. At the other end of the spectrum, there was the decisive victory of Franklin D. Roosevelt (1936) who was re-elected triumphantly leaving the Republicans with the two small states of Maine and Vermont. On the other hand, and in an almost negative image of the 2012 election, we find the Jimmy Carter election results of 1976. It firmly placed in the Democratic camp all of the southern states often associated with the Republicans. On this closer examination, I had difficulty in reconciling the three maps above to the political immutability underpinned by the ‘2012 – 1846’ image. Were there changes or not? Looking at a wider scope of images mapping the results of previous presidential elections, it is clear that there have been many changes over the years. The problem with a comment like the one that Michelle Lawrence made, is that it is simplistic and sensationalist. The difficulty of reconciling what is seen and what is said resides in the fact that these particular maps are not speaking about the same thing. The context is warped. Presenting pictures that look alike offers a simplified view of the past and of the present. It is a truncated, veritably ‘fake’ reality. There has been a lot of talk about polarized American viewpoints and this dual image suddenly offers proof of legendary division. If we are truly interested in evaluating voter diversity in the United States, we should look farther. 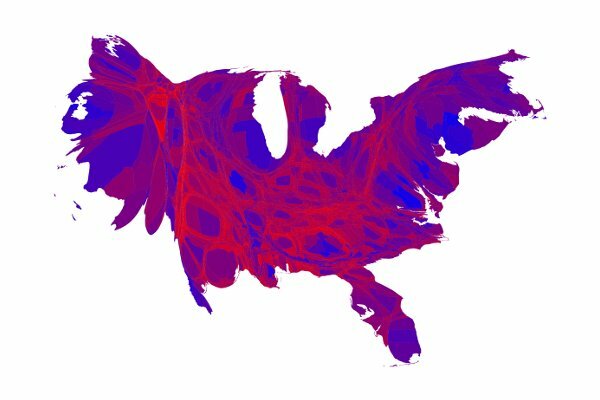 Perhaps we should begin with the maps of Purple America, and migrate to the cartograms of election results complied by Mark Newman of the University of Michigan. But, the deed was done. I had, in a burst of thoughtless enthusiasm (as is often the case on the Internet), joined the ranks of 45,000 other Facebook users who had also shared the maps and the comment. At first, the juxtaposition of the NOW and THEN image, seemed to offer an eloquent synthesis of the situation, but ultimately it is clear that all who clicked to share were duped. If the shortcut was not a trap, it was certainly a cul-de-sac. 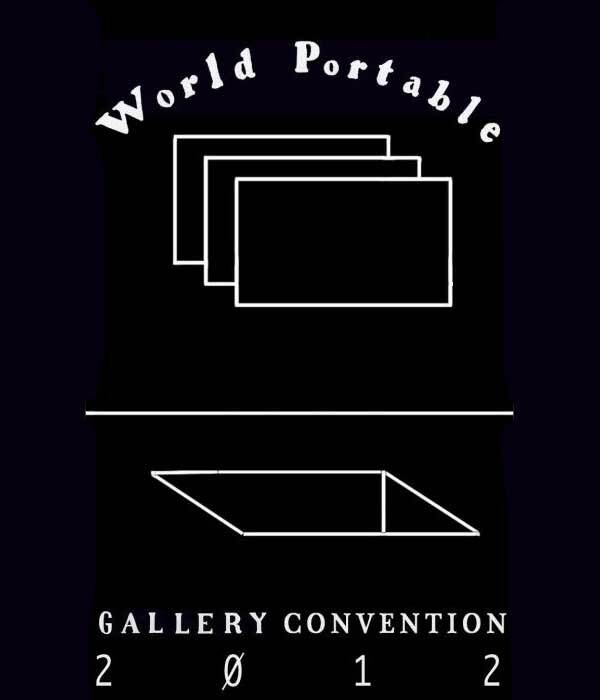 The World Portable Gallery Convention 2012 is an international convention on portable galleries and alternative spaces hosted by Eyelevel Gallery during the month of September. The project celebrates the variety of spaces with which curators around the globe have extended public interaction with art institutions. Description: Join us in celebrating the dawning of a new era where gallery’s roam free and the wine pours like onsens of morning coffees. Paul Hammond and Francesca Tallone will deliver a curator’s presentation on Halifax’s legendary Gallery Deluxe Gallery. Judy Freya Sibayan’s Museum Of Mental Objects will take on it’s newest form, and the main gallery space will be filled with Halifax’s newest portable and alternative galleries. Eyelevel’s first exhibition in our Member’s Gallery will include work by our very own Fixed Cog Hero, and Liz Johnson, Michael Eddy and Michael McCormack will kick things off with a toast to the WPGC 2012 in Halifax. Round Table Discussion: Bernard Smith and other special guests. Description: Halifax is the scenic capital of Nova Scotia and the largest city in the Maritimes. It is famous as a tourist port of call and a cultural and historical hub, despite its ailing economy. Discussions about constructing a new convention centre in the downtown core have cited economic spinoffs and putting the province on the map. This means more visitors, more meeting, more deals, more money…eh? With Halifax as a backdrop, our convention seeks to look at why we gather, and the many different qualities of convening. We invite everyone any anyone to come and share your thoughts in this discussion. WATCH: http://www.youtube.com/watch?v=I_LLIIEypoA or watch our live interview on the CTV morning show on Tuesday, September 4th at 7:45am. 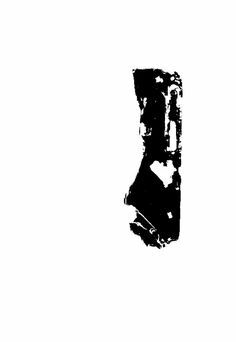 OIL is a program of short videos exploring issues and relationships we have with oil, both politically and poetically. I am very happy and extremely proud of the program, the works are excellent and thought provoking. This project would not have happened without the generosity of all the artists involved, and all of the work by Vicki Chau and EMMEDIA. I would like to thank everyone for his/her willingness to be part in this! Oil. It fuels our cars, it furnishes our homes, it feeds our debates, our wars. Oil, almost magic, which can be transformed into a multitude of products, toys, fertilizers, carpets, shampoo, insulation, golf balls, credit cards, lipsticks, plastic bags, bottles. A strange philosophers’ stone giving immortality to pop bottles and plastic forks. How are we going to negotiate our dependency and oil addiction with our environmental concerns? Who defines the Industry practices? How can the individual contribute to the emergence of solutions? What is the role of the artist, writer, poet? OIL is looking for slick short videos to fuel the discussion! Daniel Dugas will curate the program, through a call of submissions that is open to local, national and international artists. We are looking for videos that address and explore the issues and relationships we have with oil, either politically and/or poetically. The program will be screened on July 12, 2011, which is the one-year anniversary of the capping of the BP well in the Gulf of New Mexico. – Must be under 5 min. – Must be submitted on either data DVD as a .mov file or Mini DV, if sending by mail. – Must not be an original copy as EMMEDIA will not accept responsibility for loss of, or damage to any submissions. – Submissions will not be returned unless accompanied by a SASE. – Artists will be contacted if selected. Please no phone calls. – If you are selected, screening fees will be paid in accordance with the Independent Media Arts Alliance (IMAA) fee schedule. All submissions must be received by EMMEDIA on Wednesday, June 1, 2011 @ 4:30PM. Postmarked or late submissions will not be accepted. Daniel Dugas is a poet, musician and videographer. He holds an MFA, Time Arts from the School of the Art Institute of Chicago. He was an artist in residence at: the Banff Centre, in both in the Visual Arts and in the Music Department; Sculpture Space, New York; EMMEDIA, Calgary; A.I.R. Vallauris, France, and more recently at the Sydney College of the Arts, Sydney, Australia. His sixth book of poetry: Hé!, was published last spring by Les Éditions Prise de Parole, Sudbury, Ontario. This spring, he will be participating in the Festival international et Marché de Poésie Wallonie-Bruxelles as well as the Frye Festival. Daniel is currently living in Moncton, New Brunswick where he is pursuing a PhD in creative writing at the Université de Moncton. But what are witnessing here, an endless supply of oil, right in the middle of the so called Peak Oil  period? And like oil thrown on a fire, another great spectacle, the World Cup is there to keep us busy, to distract us from the first event. “Uncertainty is organized everywhere” to paraphrase Guy Debord , the French theorist. Hopefully the Oil Spill in the Gulf of Mexico is not a machiavelic test orchestrated by the great powers of the world to study and chart the reactions of people. I am nonetheless certain that an army of analysts is mapping the degree of anger; the levels of docility; and the limit of tolerance of the local populations along the coast. May 3, 2010. On the radio this morning, I hear that the oil is slowly gushing out, thousands of barrels a day from the floor of the Gulf of Mexico. What does gushing slowly mean? 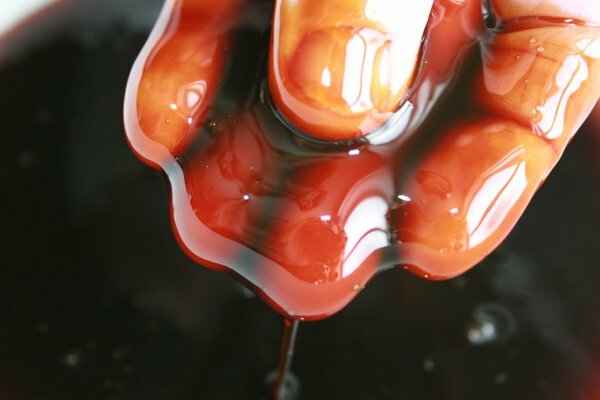 Can the flow of oil come out suddenly, copiously, forcibly like a hemorrhage, and slowly, all at once? Who has qualified the speed of this spill? bp has also invested in its branding, they are after all, the greenest of the oil giants. Its glorious logo is a vibrant leaf-like-sun-emitting symbol of hope and responsibility, a beacon of everything green, or is it? Whatever lies under the beauty of the graphic remains a mystery but the image is so beautiful that we want to trust it. Even the Green Party of Canada must have thought that it was irresistible; as they too have a similar emblem. I admit that Napoleon could have been killed with a bullet but he was slowly poisoned instead. The difference is minute but the outcome is the same. Dr Overton went on to compare the situation to a house fire; ‘a room might be on fire, but it doesn’t mean that the house is in danger.’ Here I’m guessing that the doctor might be comparing the oil spill, or the Gulf of Mexico to the ‘room’ and the rest of the planet to the ‘house.’ (?) He was actually talking about the environment as a series of compartments, secluded from one another, with fire doors in between habitats. (much like a pillbox of weekly medication) Overton claimed to be not associated with any oil company, but really? Considering the size and significance of the Gulf of Mexico to the planet’s ecology, how could an environmental professor, acting on his own, create this house analogy, and not show more concern for the kitchen? In the 1970’s the Canadian government built a series of American style bungalows on native reserves in Manitoba. The native people were puzzled by the architecture of the buildings, wondering why someone had to open a door and go through a hallway to open another door to go into another room. It seemed unnecessary and they decided to re-design their homes, opening them all up, effectively creating a space closer to their traditional view of the world. Everybody can see that the clouds and the birds cross the political borders of our world without even thinking about it, and why would they? Like acid rain, oil will not stop on a specific latitude or longitude. On their website, Time Magazine has brought back its top 10 environment disasters page. The oil spill in the Gulf of Mexico might even make the list if the leak, as they call it, continues. Oil companies have a specific way of wording their messages. A leak sounds to me like a dripping kitchen tap, something annoying but that you can learn to live with. Obviously this is more than that; it is a rupture, a break, a hole. 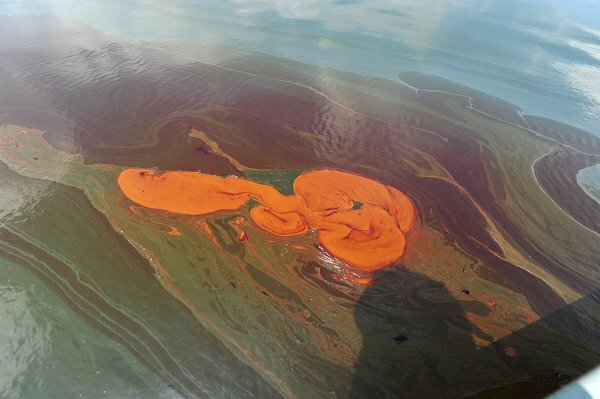 Suncrude, the world’s largest producer of synthetic crude oil from oil sands in Alberta is the owner on the infamous Aurora tailings pond where some 1,606 waterfowl died after landing in it. The idea of a pond is good, it sounds small and cute, it brings forth image of the famous Walden Pond; a place to reflect and think. They are places where life forms flourish. But those tailings ponds are artificially created, huge lake-like forms where poisons are deposited; they are settling areas for toxic waste. This latest catastrophe in the Gulf of Mexico comes after years of environmental awareness, after years of being told the difference and the importance of not using plastic bags, which are made of oil, after years of composting, of sorting through the garbage – recycling the dry from the wet, the toxic from the organic. We were told, and we believed, that the biggest part of the problem resided with the consumers and not the industries, with us – and not – with them. ‘Our actions will save our fragile planet’, and we bought it. We thought that it was important enough. We listened to Al Gore warning us about the warming of the planet, we accepted to pay more for green energy; every little bit helps as they say. After two weeks, where are Gore and Suzuki? Did they say anything? Will they? Should they? Aren’t their rooms heating up from this localized fire? Is there smoke seeping under their doors? Should I really put my chip bag in the trash or just toss is out in this great garbage can of a world? We live in a world of slogans, the great motivators of our lives, along with the loyalty programs that exist out there. Beyond Petroleum (bp), Make things better (Toyota), Solutions for Today’s Energy Challenges (Halliburton) or Solutions are in our nature (David Suzuki) – they all offer visions of optimism and possibilities. But this time the deception is complete, our optimism exhausted. What made us believe them, what made us buy into their dreams? What is the next step, the next greenwash, the next empty word to be flaunted before our eyes like carrots. Is there a roundabout in the dead end of marketing? Environment has become a buzzword – or it was until recently – and a dreamscape where we project ourselves, perhaps into the future. Avatar worked because of all of those years of learning, of trying to be more in tune with Mother Nature, but Mother Nature is about to become one big ‘fucked up’ lady. But wait! There is hope, bp has a plan, the building of a Containment Pollution Chamber as they call it, a huge compartment of steel to catch the oil and pump it onto a barge waiting at the surface. The manager of the Operations for bp assures the public that bp has a plan B, C, D and F, in case the Containment Pollution Chamber does not work. How can bp have so many clean up plans when they were out there drilling without any safety net? Did they really think that all of their dollar bills would cushion their fall? But here we are, in week number 2, and everyone is enthralled about the engineering marvel of the container. It sounds like a Hollywood movie. An impending disaster — think the disabled spacecraft in “Apollo 13″ or the asteroid hurtling toward Earth in “Armageddon” — prompts a daring intervention by engineers to save the day. Somewhere else another announcer talks about the box as some kind of Egyptian project. Hooray! We will have our own pyramid! The cable news networks keep showing workers welding the metal sarcophagus that will make everything go away. Why are we so in awe in front of this engineering accomplishment? Is it because it creates a simple superhero narrative, with good guys on one side and bad guys on the other. Evil is lurking, slithering, dripping out of the kitchen tap, and meanwhile … the Heros are working overtime on a plan to place a gigantic encasement tomb to save the day. The problem is that the good guys and the bad guys are one entity, one being. 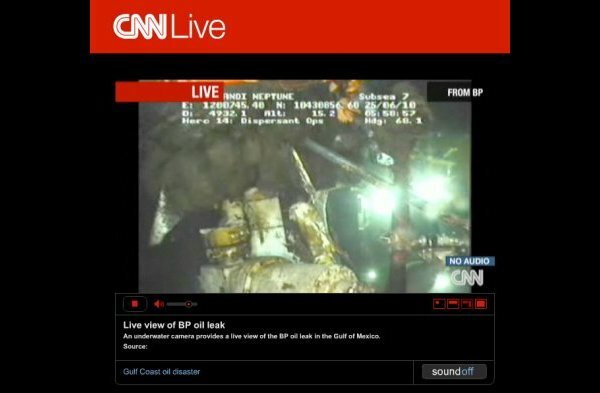 And why are we so excited by this chamber and not by the remote control switch technology lacking on the Deepwater Horizon Platform, and still lacking on all of the other 4,000 drilling platforms in the Gulf of Mexico? And how come it was not there? The European Union forces drilling platforms to have a remote control switch to shut off wells. We have the same idea in our homes, which we all agree is a good one – a switch to turn off the water main in case there is an emergency. It is mandatory in EU but not in England where bp has its headquarters. The company refused to implement the practice because of its cost, about half a million dollars. Will this go away? When will it go away? When will you be able to go to the store and buy Gulf shrimps; when will you go back into the water; walk on the beaches and play in the sand? The executives of bp are as picky as everybody else when it comes time to choose the location of their next holiday. If this spot is ruined, it does not really matter, their world is made of many compartments and they will find a corner that is still unspoiled, pristine, the perfect fit for their families to frolic candidly. And if there are no more corners, they will build one and put fences around it – period. If we worry about products that are not tested on animals we should be dead worried about this experiment. There has never been anything like it; it eclipses all that we have known. And beside the health risks involved, there are also the risks to the reputation of prominent figures. Armies of lawyers from bp to Halliburton are already devising their escape routes, planning to surrender on their own terms, perhaps even negotiating for immunity – with bonuses. At worst they will go bankrupt like Union Carbide did following the Bhopal chemical disaster in 1984. The bankruptcy of Union Carbide permitted Dow Chemical to purchase the corporation without acquiring the Bhopal legacy. The lawyers for bp and its associates are certainly looking at this option right now. And let’s not forget the banks, which were too big to fail, yet they were rescued. Could bp fall into the same category? Then on May 1, came Faisal Shahzad, the Times Square car bomb terrorist. Was this for real? The timing of this failed bombing was very strange. It pulled so much attention away from bp that I have been wondering if this was not a set up. Yes I know, another conspiration theory, but you have to admit that timing is everything. The Nashville flooding, on the other hand, would have be too difficult to stage even for big oil. Even if the Time Square event is not related to the spill, it does bring an interesting thread into play. No terrorist could have created such havoc as bp is doing right now. The effects, the range of devastation and the implication for the ecosystems and the people who live in them is way outside the Al-Qaeda league. The impending approach of the oil slick is terrorizing people and animals alike, it is creating fear and anxiety – in other words: terror. Al-Qaeda could not have done this, but here we are, with bp at the helm. It is backed by the Government of the United States of America that has sanctioned offshore drilling; leading us to rest assured in the belief that it was clean, safe, and environmentally friendly. Good going! Could this become a case of National Security? Let’s imagine for a moment that the oil slick has reached the coast, and is making its way into the ports, like Mobile, Alabama for example. And then a little thug, a budding homegrown terrorist or one from abroad, goes out on a stroll, throwing a match in the mixture. Could this happen? What would we do with the bp executives then, would they be going to Guantanamo? And what about the US government, would heads roll there? Unlikely scenario. Could this be a case of crime against Humanity? The human specie, humankind, what is known as Humanity is intimately intertwined with the animal kingdom, isn’t it Mr. Susuki? What is done to them is done to us? Maybe? Unlikely scenario. bp Finally Caps The Well! World Wins Battle Against Evil! And then, for years and years and years the company battles in the courts, negotiates the terms of reality, reduces and minimizes its responsibilities. The lawyers decorate their offices and buy new suits and then redecorate again and buy more suits until all the money has gone out, like the oil of an old well. Bankruptcy is declared and then another company comes along and takes it over, plucking it like a dangling fruit, ready to be eaten. Likely scenario. Image: A thick patch of goo and oily water floats in the sea a 1/4 mile from the Sand Dollar Marina in Grand Isle, Louisiana. Je suis déçu d’apprendre que vous avez accordé à Monsieur Harper l’autorité de fermer le Parlement. Tristement on dirait une scène de Ubu Roi. Le Premier Ministre, incapable de mesurer la gravité de ses actions a créé une situation explosive. Nous voilà du coup replongé dans des tiraillements régionaux sans fins et ce en plein milieu d’une crise économique mondiale. La hargne des conservateurs envers les députés du Bloc Québécois est un geste abject qui n’a pas sa place dans une démocratie. La prochaine étape est sûrement de les proscrire, de les chasser de la colline. Notre Premier Ministre n’est pas un rassembleur, il est de ceux qui attisent les divisions. Régner par la dissension n’est pas une nouveauté, ce qui est nouveau ici c’est votre soutien, votre approbation. Je suis bouleversé quand je regarde le comportement arrogant de Monsieur Harper. Je suis consterné quand j’entends le discours aliénant des conservateurs. Quelle fourberie! Je pense aux jeunes qui regardent ce qui se passe et je me dis que ce n’est pas un très bon point de départ, que ce n’est pas une belle éducation. Une des priorités de votre mandat est le programme jeunesse. Vous encouragez les jeunes « à tisser des réseaux de solidarité entre eux et à s’allier la collaboration des autres générations dans leurs projets » En soutenant le gouvernement vous encouragez la jeunesse à s’abîmer dans le désillusionnement. Si la démocratie peut si facilement être détournée, ici chez nous, au Canada, quelles sont les chances pour quelle puisse vraiment exister ailleurs? Il s’agit d’une performance à propos du protocole et des conventions. Le roi (Dugas porte sur sa tête une énorme couronne en fer galvanisé qu’il attache sur sa tête) se promène entre ses deux châteaux : à l’ouest le Château à Pape et à l’est le Château Moncton. L’un est un restaurant l’autre un hôtel situé à 500 mètres. Le performeur porte des bottes aux semelles velcro et un page (Clément Dugas) déroule à un tapis rouge à ses pieds. La promenade sur le sentier est maladroite et ridicule, le tapis colle à ses chaussures. Cette action sur le dérisoire sera répétée pendant le Symposium. Détournement de sens, mise en abîme d’un univers chevaleresque qui a perdu des plumes et qui pourtant maintient ses symboles désuets. La même journée, Daniel Dugas présentait sa performance Le tapis rouge aux touristes attendant la montée du mascaret. 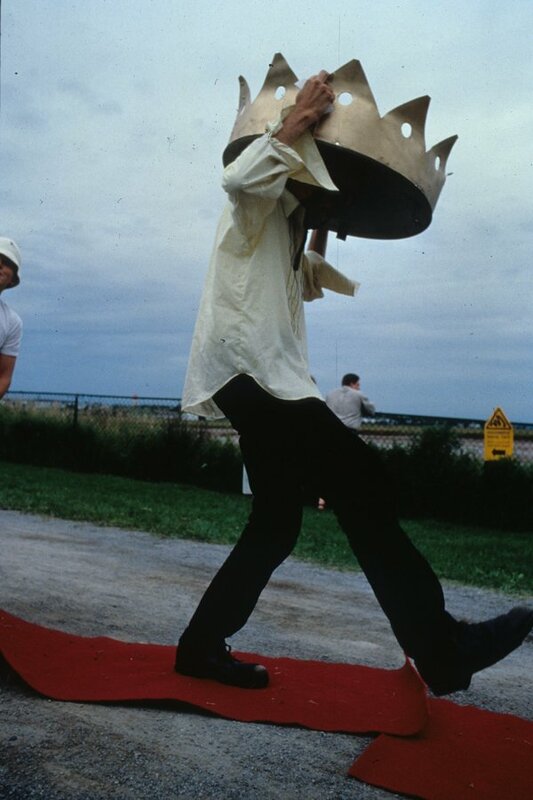 Le Roi Dugas a arpenté douloureusement son chemin de gloire, sur deux courts rouleaux de tapis rouge que déroulait tour à tour le page et sans doute dauphin, Clément Dugas, devant Sa Majesté. Mais à l’image de la Petitcodiac, le Rayaume est manifestement en ruines; l’habit royal était plus que sobre, la couronne un vulgaire chapeau que seul sauvait sa grande dimension, et les deux trop courts morceaux de tapis rouge collaient aux chaussures du Roi, l’empêchant de cheminer avec toute la dignité. De son rang : bien au contraire, Sa Majesté s’empêtrait, tombait, s’emberlificotait, incapable de maintenir dans sa démarche son glorieux passé. Performance d’une simplicité percutante, mais qui’il faut savoir décoder.